Yesterday I sang the praises of an orchid, today I am waxing lyrical about an onion, or a garlic to be precise. Monday’s Spring Flower Candy is a complete contrast to pretty Pleione formosana, although both plants grow from bulbs and enjoy a moist woodland environment. My subject is Allium ursinum, better known as ramsons, stinking Jenny or wild garlic, the ephemeral herb that’s responsible for filling ancient English woodlands with a mildly oniony scent throughout the month of April. When happy it produces a continuous blanket of emerald green leaves as far as the eye can see. As usual the latin name gives away something about this wild plant: ‘ursine’ means ‘related to bears’ and this refers to our furry friends’ liking for digging up the bulbs whilst out hunting. Thankfully we haven no bears left to compete with when we go foraging. 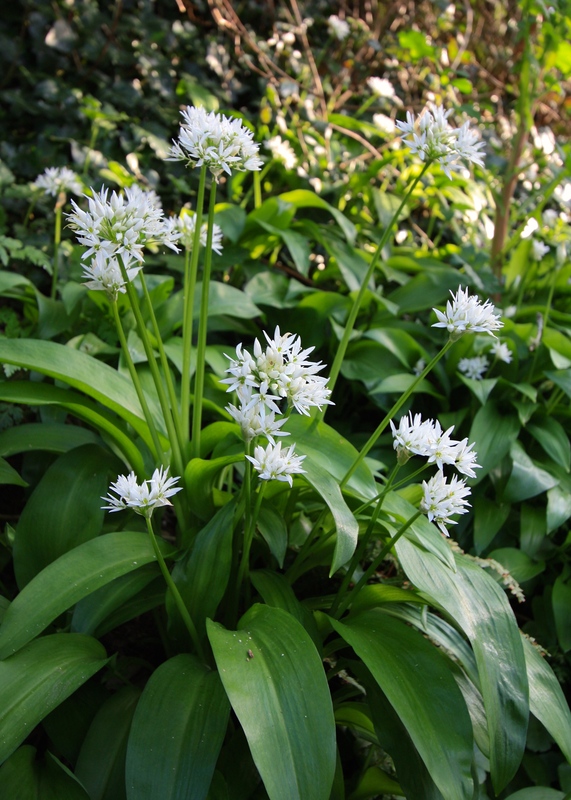 Wild boars are also partial to a little wild garlic, so the latin name might just as easily have been Allium porcinum. Bears clearly have good taste as the newly emerged leaves are delicious, especially lightly steamed and dripping with butter. They are also tasty stirred into a pasta dish, made into pesto or used as a replacement for chives in omelettes, soups and stuffings. In Switzerland cows were once fed with wild garlic in order to impart a garlicky flavour in their milk. This was then made into a savoury butter. The leaves are not in the least bit coarse, withering and disappearing beneath ground again before they have a chance to toughen up. I find wild garlic pretty easy to identify, especially once the little heads of white flowers (also edible) start to emerge, but care should be taken when collecting leaves in the wild. Cases of poisoning have been reported as a result of mistaken identity – sometimes for arum lilies and sometimes for lily of the valley, both of which are toxic and like the same conditions. The smell of garlic is something of a give-away so, if in doubt, rub the leaves and that will confirm if you have the right plant. Always pick over the leaves and give them a thorough wash before cooking. If you want to be sure, and have the right conditions to grow your own, seeds are available from Chiltern Seeds. The BBC Food website suggests a range of recipes that harness the delicate flavour of wild garlic, including honey and za’atar glazed spring lamb with salsify and wild garlic purée, and king crab with asparagus, wild garlic and hazelnuts. My mouth is watering just thinking about it. Wild garlic is a seasonal treat that can rarely be bought, so don your wellies, seek it out and give it a try. Happy foraging. Just read your blog after cooking myself the most delicious wild garlic and chorizo omelette for supper. I picked it from the edge of my woodland garden where the wildness creeps into the garden. So pretty and such a joy st this time of year. Sounds scrummy Sarah. I imagine wild garlic works really well with chorizo. How lovely to have some in your own garden (wild garlic that is!). Interesting. I’ve seen ramsons referred to in books before,but never seen them. So, I appreciate the picture and your description. We have a similar allium here in North America that is called “ramps”, Allium tricoccum. It is also sought after by foragers. It is a spring ephemeral, but different than ramsons because it comes up in April as leaves, shaped much more like lily of the valley than ramsons are, and then doesn’t bloom until much later when the leaves have already died back. So the flowers appear on stalks that push out of the bare ground or through whatever else is growing new to them. And the flower is a round head like many of the decorative allium. Both are very beautiful, yours is actually more decorative with the blooms and leaves appearing together. Sounds yummy. Seeds won’t be fast enough, so I feel a foraging trip coming on. I believe it can be quite invasive if it gets too comfortable, so plant your wild garlic somewhere it can romp away without causing havoc. Garlic has lots of health benefits doesn’t it? I love cooking with wild garlic during that fleeting time when the leaves are young and fresh.